The Sheldrick Elephant Orphanage is located near Nairobi National Park. This orphanage for Elephant Calves and Rhinos from all over Kenya was founded and still managed by Daphne Sheldrick, the widow of one of Kenya's best known Game Wardens David Sheldrick. David Sheldrick was at the centre of the 1970's Ivory poaching wars in Tsavo National Park. Daphne Sheldrick Elephant Wildlife orphanage is a great place to go for a day tour from your Nairobi hotel to see the baby elephants as they are being taken care of by the caretakers. The Daphne Sheldrick elephant orphanage takes care of abandoned elephant babies and brings them up using baby milk formula and providing companionship and social attention until they are adult enough to go back to the wilderness. The baby elephants in the orphanage are brought in after losing their mothers from poaching or being abandoned in water wells, in pits and near villages. The baby eles are so fragile that they even succumb to pneumonia when young. They are taken care of by being fed on milk formula from plastic feeding bottles until they are big enough. The David Sheldrick elephant animal orphanage is managed by the David Sheldrick Trust which has many other anti poaching and desnaring projects in Kenyan parks. The trust was started after the death of David Sheldrick, Husband to Daphne Sheldrick in 1978. He was the founder game Warden of Tsavo National park, the largest protected area in Kenya measuring 21,000 sq km. You will be given the life history and names of all the baby elephants at the Daphne Sheldrick elephant sanctuary and how they came to be orphaned. The baby elephants are so free with people that they will come very close to be touched by you in a special enclosure where people can interact with them. 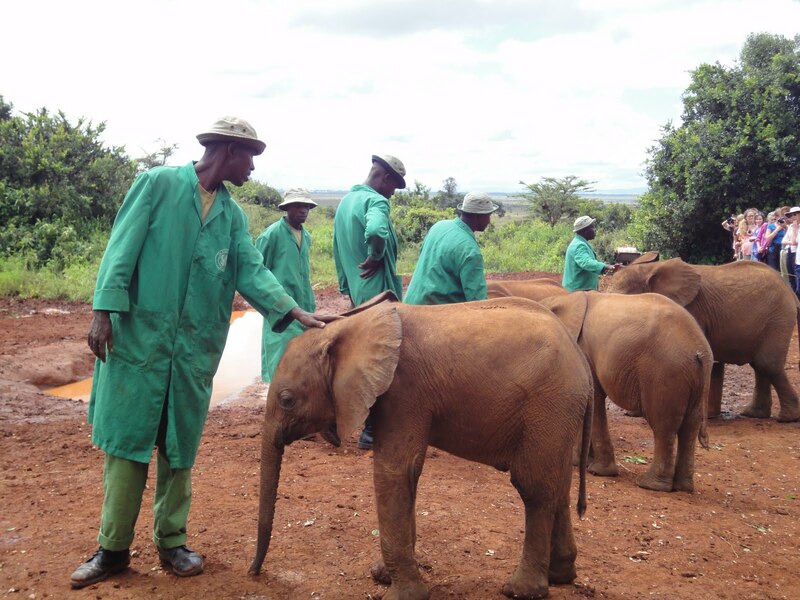 David Sheldrick Elephant orphanage where you come close to elephant calves! Daphne Sheldrick As part of the David Sheldrick Conservation Foundation rehabilitates baby elephants and other wildlife here at her home just outside of Nairobi National Park. These babies have lost their mothers to poaching, death, injuries,on getting lost in the wild or other tragedies. Daphne and her dedicated staff raise them to be released back into the wild when they are ready. Its worth visiting and see humanitarian care to the wildlife and the heart it takes to care. They charge a small entrance fees instead you can buy a souvenir or donate for the conservation. Airport transfer from Nairobi Jomo Kenyatta International airport or Wilson airport to Daphne Sheldrick Elephant Orphanage or transfer from Daphne Sheldrick Elephant Orphanage to Nairobi Jomo Kenyatta International airport or Wilson airport.